Why should you buy organic corn? So Dow entered the food industry and genetically engineered seeds to produce plants and bear fruit that appear healthy even after exposure to Dow’s chemical toxins. Their most recent creation, Dow Corn, is resistant to 2,4-D, the powerful herbicide that was a major ingredient in Agent Orange. 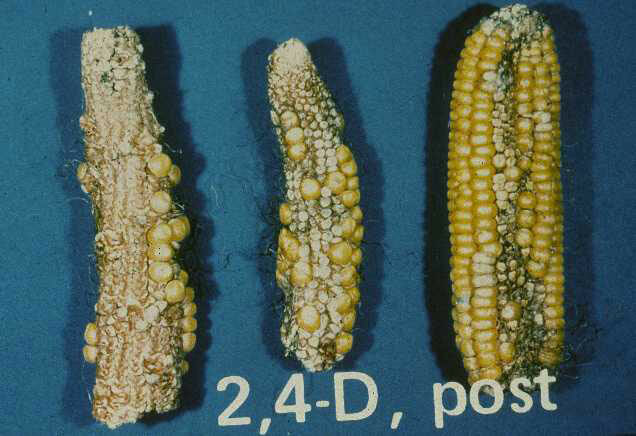 Why do we need corn to be resistant to 2,4-D if we no longer use it on crops because we now know it’s so damaging to human health? Because we’re spraying crops with it anyway. Photo via: Corn exposed to Dow’s herbicide 2,4-D. Dow’s new GMO corn is able to withstand the same exposure — but show no physical mutations. Author WEPosted on April 26, 2012 August 16, 2012 Categories Breaking Health NewsTags Agent Orange corn, corn, Dow Chemical Company, genetic modificationLeave a comment on Why should you buy organic corn? The documentary “Fat, Sick & Nearly Dead” explores and promotes juice fasting. Extreme? Yes. But America’s problems are extreme as well, and the film made me wonder if juice fasting could help some people. For the obese and morbidly obese, juicing is certainly a less invasive alternative than surgery. At the start of the documentary, both protagonists are obese and fighting auto-immune diseases. Like so many Americans, Phil wants to be healthier but doesn’t know how to begin. Under the mentorship of the film’s narrator Joe, Phil embraces juicing, quits his unfulfilling job, quits prescription pills, and rewrites the story of his life. His transformation is uplifting — and inspiring. The full documentary is free on Hulu.com right now. You can watch this documentary HERE. Watch 60 Minutes: Is Sugar Toxic? Sweet treats made with organically-sourced sugar are one of my few dietary indulgences, but I’m realizing it’s time to face the music and limit my sugar intake. What about you? Does this special change the way you think about sugar? The original segment is published here: 60 Minutes: Is Sugar Toxic? Author WEPosted on April 2, 2012 April 29, 2013 Categories Recipes, Baking, & Cooking, Watch: VideosTags 60 Minutes, insulin and cancer, poison, sugar, sugar and cancer, sugar and tumors, sweeteners, toxic1 Comment on Watch 60 Minutes: Is Sugar Toxic? Throughout the year, you’ve probably acquired a few things, and spring is the season to sort through your belongings, organize, clean, and rejuvenate your home. Enter: Spring Cleaning! My strategy for sorting through my ever-increasing piles of accumulated “stuff” is the standard 3-pile system: Keep / Toss or Donate / Not Sure. The first pile is organized and put away. The second is tossed or given away. The third pile — the possessions and clothing I’m not sure I’m ready to part with just yet — is boxed and stored out of sight. A few months later, I pull out the box and take a second look. The sentimental pulls and the ‘what-if-I-still-need-this-in-the-future?’ questions seem to disappear when you’ve forgotten about something for several months. I almost always toss or donate everything at that point. In the same way that losing weight is easier than mantaining a weight loss, decluttering your home is often easier than simply maintaining a decluttered home. The true challenge is not replacing the possessions you’ve tossed or donated. Need some motivation to let go of a few things? Take just twenty minutes to watch the video above, The Story of Stuff. The Story of Stuff is a documentary about consumerism and sustainability. Created in 2007 and narrated by Annie Leonard, the video’s messages are timeless. The Story of Stuff made me rethink the way I make purchases and provided me with a completely new understanding of fashion. Before you make one more purchase — from a coffee maker, to a couch, to shoes — you must watch The Story of Stuff. On the subject of Spring Cleaning, The Well Daily has written up a list of tips for green cleaning — learn about using vinegar here and lemon here as natural alternatives to toxic cleaners. You can learn more about The Story of Stuff Project by visiting their website here.